Then on a Wednesday night, between 7pm and 8pm, it's time to taste the wines and beers, give your views and suggestions for what to eat with the wines using the Twitter hash tag #BoothsCheers. 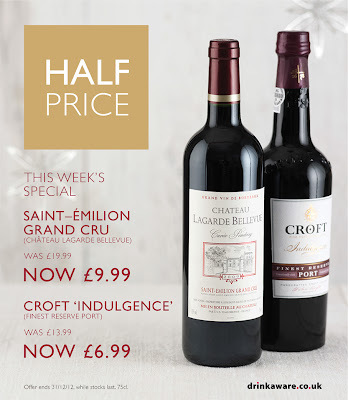 Now we have had forewarning that one of the bottles that will be delivered this Wednesday is a bottle of Croft Indulgence, Finest Reserve Port. So I thought I should get prepared with something suitable to eat while tasting it. I rarely prepare meals from scratch during the week, if I did it would be far too late when we finally sat down to eat. So I tend to prepare meals at the weekend and put them in the fridge or freezer, ready to be popped into the oven to heat through. I also often make double, so we had this bake tonight (Sunday) and will have it again on Wednesday. Anyway there is some very obvious word association going on here: Port > Stilton >Walnuts. I did think about making a flan but in the end decided to make a bake instead. 1. Slice the potatoes, cover with a little boiling water and some clingfilm and blanch the potato slices in the microwave for 3 minutes. Drain the water off and lay the potatoes in the base of an ovenproof casserole dish. 2.Chop the bacon into small pieces and dry fry in a large pan, turn down the heat slightly and add the onions and garlic. Cook until softened. 3. Add the spinach and put the lid on the pan, cook until the spinach has wilted. 4. Spread the mixture over the potatoes. 5. 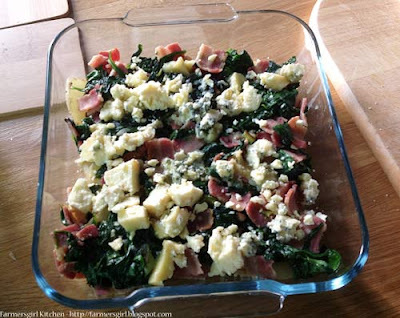 Crumble the Stilton and spread over the spinach mixture. 6. Make the white sauce add the nutmeg and season, but go easy on the salt as the cheese and bacon are both very salty. Mix the egg with the yogurt and add to the white sauce, pour over the rest of the ingredients. 7. 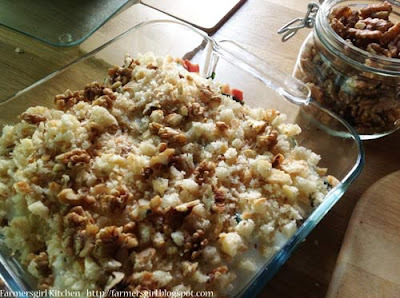 Cover the sauce with the breadcrumbs and sprinkle over the walnuts. 8. Cover with foil and bake in the oven for 25 minutes at 200C, remove foil and bake for a further 5 minutes to crisp the breadcrumbs without burning the walnuts. Join me at the Twitter Party by following @BoothsCountry and tweeting with the hash tag #BoothsCheers on Wednesday night 7 - 8 pm, to find out how well my Stilton, Spinach and Walnut Bake goes with this week's special deals. 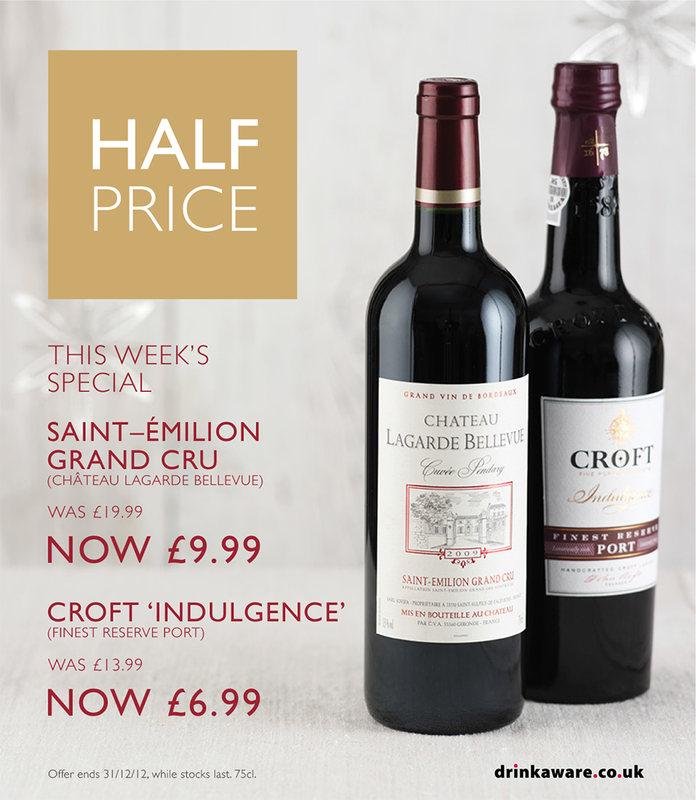 Click through the link to find out more about the 12 Deals of Christmas, the Twitter Party and also the in-store tastings. oh man I want to be there whilst you eat this and drink that beautiful bottle of port... love the combo you've got going on there Janice... loverly stuff! The bake looks delicious, all such lovely ingredients!